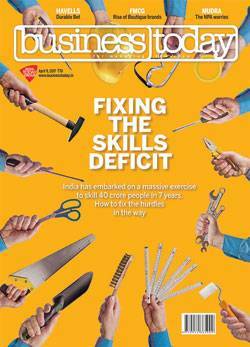 This refers to your cover story on skill development (Skilling Jugger- naut, April 9). The study has nicely portrayed the approach of certain good samaritans in developing training projects, sacrificing their personal development and career prospects at the altar of the social cause of skill building and employment generation on distinctive models. The Ministry of Skill Development and Entrepreneurship has the responsibility of forming integred skill development schemes among Central ministries, states and NGOs to provide on-the-job training avenues, speedy employment facilities and supportive systems on technical and non-technical platforms for India's economic development. Also, the skill development process must aid proposals for agro-based growth to teach modern techniques to the rural youth for balanced economic progress. Hope the skill development by the competent training authorities will bring out great capabilities of the youth as the beauty of the diamond is only revealed by the skill of the diamond cutter. This refers to your article on newly-elected governments' task for kick-starting growth (Job at Hand, April 9). With the massive win in UP and Uttaran- chal, and after forming governments in Goa and Manipur, there is a huge responsibility on the BJP's shoulder to not only fulfil the promises made to voters during polls but also create as many jobs as possible so that the economy revives. Especially in UP, the new government will have to ensure that the law and order situation improves manifold and the massive potential of the state is realised in terms of bringing industry and investment to the state. In Punjab - which has been won by the Congress - there is huge financial burden on the state's finances. And like UP, Punjab would also want a farm loan waiver to give the stressed farmer the much-needed relief. But the government should not ignore SBI chief Arundhati Bhattacharya's remark - farmer loan should not be waived without due consideration. It should not be made a general practice. Otherwise, it is the lending institutions which will feel the pain for ever, because the farmer will know that he does not need to pay as his loans will get waived off sooner or later. For reviving growth, the government needs to remove all thehurdles on the ground and provide a single-window clearance for all investment, which is going to benefit the state and generate employment. This refers to your article on "Oper- ation Clean Money" (Herculean Task, March 26). Though I do understand the government's objectives and the scheme initiated to verify individual deposits after the demonetisation drive in November last year, there is still a shortage of resources to successfully perform this task. The little time allocated to complete this shows the absence of proper homework. Having a standard operating procedure itself is not sufficient to carry out the entrusted task by officers. It is equally important to see how capable they are and ensure enough manpower and other technical assistance. I believe no government has in the past started a move like Operation Clean Money. So, there will always be certain level of technical and resource glitches. Ideally, all the assessing officers should have been given proper training and refresher sessions across the country to ensure that they are capable of performing the job in line with the objectives set.